To date Francis Joyon’s crew aboard IDEC Sport has trailed Yann Guichard & Donna Bertarelli’s team aboard Spindrift 2, (formerly Banque Populaire), but by staying south and keeping a straighter route, Joyon has now set a new world record for crossing the Indian Ocean. Joyon’s crew crossed the longitude of Cape Leeuwin at 2240hrs UTC after 18 days, 20 hours and 41 minutes of sailing since leaving Ushant and has become the first sailing boat in history to sail from Cape Agulhas to Cape Leeuwin in less than six days. To be precise, 5 days 11 hours and 23 minutes from South Africa to the south of Australia. As Joyon and his team approach the halfway stage they trail the Jules Vernes record by just short of a day, (20 hours and 41 minutes more than Banque Pop V in 2012) and have yet to get their nose in front of Spindrift. But there is more to focus on than simply another boat and a record to chase, they have their own pace to match as their boat was formerly Groupama 3 and went for the same trophy in 2010. Back then Frank Cammas was skipper and reached the same point in just over 21 days with his crew of ten. Joyon has just six aboard and is 2 days and 18 hours faster – food for thought and perhaps evidence of the validity of Joyon’s strategy. Meanwhile Spindrift 2, (that has 12 crew members), is also upbeat about their performance, even though her current position and plot when compared to the record pace appears to put her behind. It is difficult to explain how a boat can be in front when it is behind. But this is exactly what is happening on the water between Spindrift 2, who passed the longitude of Cape Leeuwin at 115° 08’ East, this Thursday, December 10 at 15:27 GMT and Banque Populaire V’s record time in 2011. The explanation is that the closer a boat is to the South Pole, the shorter its way around Antarctica, because the earth is a sphere. For example, a boat that sails along 40° South covers 459 miles for every 10° of longitude, but the same boat sailing along 50° South travels only 385 miles: a difference of 74 miles. So, for the same speed and the same course, the difference is significant. 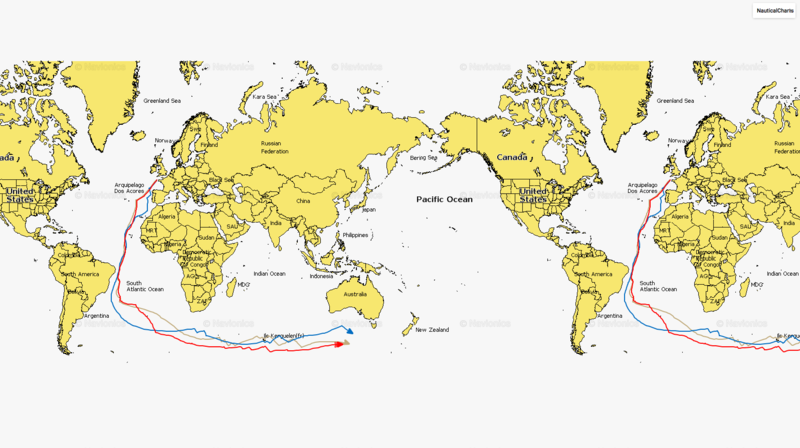 The bottom line is that both boats are maintaining a blistering pace around the world, how else can you describe 12,295 miles sailed at an average speed of 27.73 knots? Both are easily close enough to break Banque Populaire’s record but only one can win the Jules Verne Trophy – It’s hard to think of a more exciting race around the world.